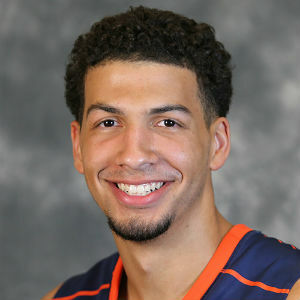 Virginia senior forward Anthony Gill (High Point, N.C.) was one of 10 players named to the 2016 Allstate NABC Good Works Team®, the National Association of Basketball Coaches (NABC) and Allstate Insurance Company announced Tuesday (Feb. 9). For the fourth year, this prestigious award pays tribute to college basketball players at all levels for their impressive commitment to giving back to their communities and positively impacting the lives of those around them. Gill is the third UVA player to be named to the Allstate NABC Good Works Team®, joining Joe Harris (2014) and Malcolm Brogdon (2015). UVA is the lone Division I program to have three players named to the team. During his three years at Virginia, Gill’s volunteerism has impacted many lives. He has mentored and counseled youth at several schools in the Charlottesville area on being a leader, an individual and the importance of respect. Gill gave free basketball lessons to under privileged kids and volunteered at the Boys and Girls Club. Gill also mentored young cancer patients and visited residents at the Martha Jefferson House. Gill, who earned his degree in anthropology at UVA, organized a successful shoe drive that sent over 150 pairs of shoes to the Dominican Republic. He also packaged shoes for the Sole Hope organization and made boxes for Operation Christmas Child. Gill made a mission trip to Jamaica and visited an orphanage and nunnery. In addition, Gill started a fundraiser for Love 146, which is an international human rights organization working to end child trafficking and exploitation through survivor care and prevention. The Allstate NABC Good Works Team® is comprised of 10 student-athletes; five from the NCAA Division I and five from NCAA Divisions II, III and the NAIA. Joining Gill on the five-man Division I team were Samer Dhillon (USC), Kyler Erickson (Nebraska Omaha), Jeff Laidig (Belmont) and Shavon Shields (Nebraska). LyDell Cardwell (Azusa Pacific), Ben Gardner (Hope College), Harry Johnson (Bard College), Jordan Saddoris (Central College) and Isaac Spence (Florida Institute of Technology) from Division II and III and NAIA completed the 10-player team. The record 257 nominations were narrowed down to the final team rosters by voting panels led by former Duke University student-athlete, two-time NCAA champion and seven-time NBA All-Star Grant Hill and 10-time WNBA All-Star and University of Tennessee student-athlete Tamika Catchings. The voting panels are comprised of former coaches, esteemed college basketball athletes and media members. While exceptional student-athletes are often only rewarded for their athletic successes, the Allstate NABC and WBCA Good Works Teams® shine a light on these 20 young men and women for their off-the-court accomplishments. In addition to countless hours spent as college athletes and full-time students, the members of this year’s team have spent their limited free time bettering communities all over the world. Whether it’s regularly volunteering in their school’s town or traveling to other countries on mission trips, all 20 players boast long lists of inspiring stories that demonstrate a commitment to improving the lives of others. Members of the Allstate NABC Good Works Team® will be invited by Allstate to be recognized at the 2016 NABC Convention and 2016 NCAA Men’s Final Four®, and will participate in a community service project to benefit the host city of Houston. Additionally, the members of the Allstate WBCA Good Works Team® will be recognized during the 2016 WBCA Convention and at the 2016 NCAA Women’s Final Four® in Indianapolis, and will also participate in a local service project. Allstate is an official corporate partner of the NABC, WBCA and NCAA. More information about the Allstate NABC Good Works Team® is available at www.nabc.org.